One of the iconic scenes from the classic movie “The Wizard of Oz” is when Dorothy, the Scarecrow, the Tin Man, and the Cowardly Lion discover that the great and powerful Oz is really a man behind a curtain manipulating a bunch of machinery. 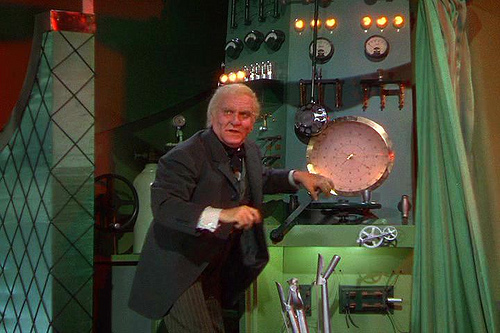 People in JACC often referred to me as the man behind the curtain for JACC. There was one year when I literally was. It was the late 1980s and computers were starting to make their way into community college newsrooms. It was only a matter of time before the made their way to JACC conferences and the on-the-spot writing (and later photography and design) competitions. But it was not easy. Colleges were required to lug manual typewriters to the conferences to compete. A few colleges tried to slip in electric typewriters, but the old Hacienda Hotel conferences had limited wall outlets. The more vexing issue, however, was among the technologists and the purists who feared that computers would give students an unfair advantage in the writing contests. And it wasn’t just that some students might still be using typewriters. Computer word processing programs had spell checkers. That would give computer users an advantage over the poor spellers who had to copy edit their work. Things got nasty at times with purists being labeled Luddites. It didn’t take long for everyone to learn that spell checkers –and later grammar checkers– were not the advantage everyone thought they would be. (We left the hotel setting eventually and moved to Fresno State University –and computers were available at community college settings used for regional conferences—but faced a whole new problem in 2000 when we left the campus setting to a hotel setting again. No one wanted to lug big computers and laptops were not yet prevalent enough. Besides, students could “pre-write” stories and sneak them into contest writing labs. And some could connect to the Internet and provide an unfair advantage. We found other uses for computers at the conventions, too. When we handed out awards at conventions for on-the-spot contests we had to hand out pre-made plaques without the winners’ names on them. Honorable mention awards consisted of typewritten certificates. Certificates had to be signed by organization officers. To save money we went to certificates for all on-the-spot contests. Using computers made that easier, too, but officers got cramps signing hundreds of certificates. Someone suggested that we scan signatures and print the certificates with printed signatures. That was a good idea, but graphic images took a long time to print. There was one convention where I was literally “the man behind the curtain.” I was sitting behind a curtain on the awards platform typing results and sending to a printer one certificate at a time. Presenters were slowing down the presentation to match the speed the certificates could come out of the printer. I ended up becoming the awards guy for the organization for years. We learned to speed up the process, but trying to print all the awards AND building a PowerPoint presentation showing winners –another idea I stole from another organization and brought to JACC— nearly gave me a heart attack with all the short-turnaround stress. I eventually built a database program that greatly reduced the stress and the incidence of user error in typing names. I have tweaked the database program over a number of years. But few in the organization understand databases and when I started slowing down my participation others started reverting the old ways of doing things. Too bad, the Filemaker-based database template I created can take existing data and spit out in a number of ways that the organization can use, all without having to re-type everything.